The temperature outside the venue in Cape Breton Isle was zero Celsius on Friday night, January 10th. But inside the Convention Center, during the first night of 2012 Canadian National Championships finals, the warmth of the 700 boxing aficionados, along with cheers and music, helped the boxers' stamina. The tournament took place in the Isle of Cape Breton, Nova Scotia, the land that saw in the mid-60's no less than five national boxing champions in different weight classes. This year the competition attracted a total of 142 participants, 47 of them females, who went to the isle to reach their goal of wining gold. Ten women were crowned champions. Among the boxers competing on that Friday night, were six females in the 51, 60 and 75 Kgs Olympic divisions, whose hunger to become the Canadian Olympic hopefuls, make them develop into the goddesses of Mount Olympus. Their force, skills, power and determination put the audience on their feet, witnessing what may be a peek into the coming as the first ever female boxing competition takes place at the Olympic Games in London this summer. Once again the trio that went to Pan American Games, where they won two golds and one bronze medal, were crowned National Champions. In the 51 Kg. Mandy Bujold, won her seventh national title with a little help from the hazards of the boxing profession. Her opponent Amanda Galle could not box due a large hematoma on her left eye stopped her from competing. During her medical in the morning, the doctors vetoed her continuing to box and Bujold won by walkover. "It is disappointing that I could not defend my title in the finals tonight but it is part of the boxing game. Anything can happen and it is out of my hands. I came here prepared to fight but either way I am already looking forward to the World Championships in May", said Bujold from Ontario. In the 60 Kg., Sandra Bizier won a close bout with Susan Hass 8-6. Hass was the 2010 69 kg National Champion. The reigning champion and Pan Am bronze medalist Bizier enjoyed her victory and is already looking forward to the months ahead. They will be competing in several tournaments and training in different camps, with the goal set for May in China and to earn qualification for the Olympics. "I am very happy. She's very strong. I am a little 60 kilos, so I have to move a lot and I think I am getting better and I finished strongly." said Bizier from Quebec. During the most anticipated female bout in the Canadian tournament, between 75kg Mary Spencer, the triple World Champion, nine time National and Pan American Champion and her eternal rival Ariane Fortin, two time World and three time National Champion, the public at the venue did not hold back their excitement as these two very well skilled boxers took to the ring. 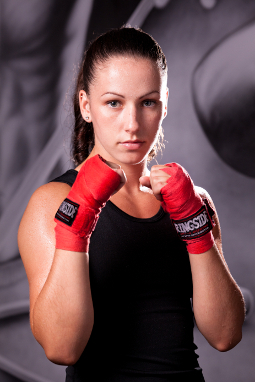 Fortin took the lead in the first two rounds, but the smart and experienced Spencer got into the third, outboxed her opponent before ending the fourth round with a flourish on her way to a clear victory 18-12. "She is an amazing fighter. It is a bittersweet victory for me right now," Spencer said after the bout. "I just defeated my toughest opponent in the world, but my friend's dream is crushed. I hope we can put it behind us and it would mean the world to me if Ariane would help me prepare for the Olympics." "It was the best bout of the tournament." Daniel Trepanier, High Performance director for Boxing Canada said. Among the other national champions, four were returning, 49kg Nathalie Goulet, 54kg Vicky Pelletier, 57kg Melissa Guillemette, and 64kg Sara Kali, all of them from Quebec. The three new champions were 69kg Amber Groome (Alberta), 81kg Maude Bergeron (Quebec), and +81kg Annabelle C. Dube (Quebec). According to Pat Fiacco, Boxing Canada President, without a doubt, the highlight of the 2012 Championships was the improved skill level of the boxers. "The conditioning of these boxers was exceptional. They were just as strong in the 4th round as they were in the 1st. Their technical skill, from throwing jabs to their movement in the ring is a true demonstration of excellent Olympic level boxing", said Fiacco, Bantamweight Canadian boxing champion in 1980 and Boxing Canada President since June 2011. "Boxing cannot be successful without female participants", Fiacco concluded.